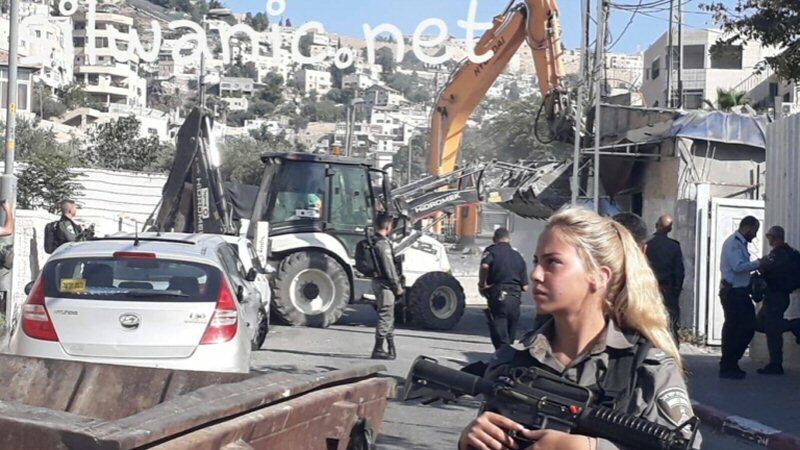 Israeli forces demolish a printing house in East Jerusalem, August 29, 2018. Photo credit: Wadi Hilweh Information Center. Israeli forces demolished six Palestinian-owned structures in the holy city in August. The European Union reported this month that nearly half of the Palestinian-owned structures demolished by Israeli authorities this year were in the Jerusalem district. Israeli authorities continued targeting Palestinian homes and businesses for demolition in the holy city throughout August. On August 6, 2018 Israeli forces demolished a storeroom and two containers belonging to a supermarket in Jabal al-Mukaber. Israeli forces demolish a Palestinian-owned apartment in Shuafat, August 7, 2018. Photo credit: Wadi Hilweh Information Center. On August 7, Israeli forces demolished two apartments in a five-story apartment building in Shua’fat. The Muhteseb family owned the apartments. Israeli authorities allege they were built without a permit. The same day, in Jabal al-Mukkaber, Bassem Obeidat demolished his own home after the Israeli municipality ordered him to do so or pay a fine of 60,000 shekels. The aftermath of an Israeli demolition in Issawiya, August 15, 2018. Photo credit: Afif Amira for WAFA. On August 15, Israeli forces demolished a duplex under construction in Issawiya. The duplex was planned to house a family of six and belonged to Nader Nasser Abu Riyaleh. Israeli forces raze land in Sheikh Jarrah, August 27, 2018. Photo credit: Afif Amira for WAFA. On August 27, staff of the Israeli Custodian of Absentees’ Property Department razed land and uprooted trees in Sheikh Jarrah under police protection. The area targeted belongs to Abed al-Razzaq al-Sheikh. Reportedly, the Israeli authorities present did not have a court order granting them ownership of the land. On August 29, Israeli forces demolished a print shop owned by the Siyam family in the Silwan neighborhood of East Jerusalem. Israeli forces shot stun grenades and used pepper spray when the shop’s owners and neighbors attempted to document the demolition. At least eight Palestinians were injured and treated in local clinics, where Israeli forces attempted to detain them. The same day, Israeli forces demolished a storefront in Silwan. The Israeli municipality zones only 8 – 13% of East Jerusalem for Palestinian residential construction. As a result, many East Jerusalem residents are forced to build without permits to avoid overcrowding. The Association for Civil Rights in Israel found that 20,000 homes in East Jerusalem – 39% of all homes in East Jerusalem – lack Israeli construction permits. Israeli land use designations in East Jerusalem. Graphic by UN Human Settlements Program. As of June 30, the United Nations Office of Humanitarian Affairs (OCHA) identified a 12 percent increase in demolitions in East Jerusalem over the first half of 2018, despite a 22 percent decline in demolitions across the Palestinian occupied territories during the same period. OCHA also reports a total of 270 Palestinian-owned structures have been demolished by Israeli forces this year as of August 27.